Jyrki69 Announces West Coast US Tour with MGT! Los Angeles, CA – Goth rock icon *Jyrki 69*, lead vocalist for Helsinki’s brooding metal band, *The 69 Eyes*, has announced a special West Coast tour with their Cleopatra Records labelmates MGT, the frontman for multi-platinum selling Finnish goth n’ rollers The 69 EYES. Jyrki has put together an exciting live band for this tour including; Ace Von Johnson (Faster Pussycat) on guitar, Ashes (DevilDriver, Static-X) on bass and Kyle Cunningham (Madlife) on drums. The live set promises to offer a healthy chunk of Jyrki69’s debut solo album “Helsinki Vampire” along with a few 69 Eyes favorites and some very special surprise numbers. Jyrki 69’s long-awaited debut album, *Helsinki Vampire*, was produced, mixed, and mastered by longtime The 69 Eyes producer Johnny Lee Michaels. The record builds on the distinctive “goth n’ roll” sound that The 69 Eyes honed over the course of a dozen albums while adding a more richly textured, darkly romantic atmosphere. The geography of music is changing a little bit as it was recently announced that Carmine Appice was reinventing the band Cactus after the departure of bassist Pete Bremy and retirement from touring duties by founding guitarist Jim McCarty. Read the full statement and inside scoop below. I’ll return at the close with some thoughts. Coming off a very successful US tour and the release of its first studio album in 10 years, Black Dawn, the time has come for founding member and world renown drummer Carmine Appice to re-energize and rebuild Cactus. The band was once heralded by critics as America’s answer to Led Zeppelin. Appice announced today two new members to the legendary band’s line-up: bassist Jimmy Caputo and guitarist Paul Warren. Caputo replaces bassist Pete Bremy, who has left Cactus to pursue other projects. Warren, best known as lead guitarist for Rod Stewart, Tina Turner and Joe Cocker, will be the band’s new guitarist for touring, taking over for founding member Jim McCarty. McCarty remains a writing and recording member of Cactus but unfortunately is unable to tour with the band due to health reasons. Lead vocalist extraordinare Jimmy Kunes and harmonica wizard Randy Pratt, both of whom joined when the band re-grouped in 2006 remain in the line-up. The Details: It’s without question that the last year or so in the life of the band known as Queensryche has been a tumultuous one and now there are two separate sides of the music fence when it comes to the group. On one side, the bands original singer Geoff Tate with a brand new band and on the other, the rest of the guys with a brand new singer. I’ve supported the group since the beginning and have chosen to keep this practice up with coverage of both sides and that made me excited when I learned that Queensryche featuring Geoff Tate, the Original Voice would be performing at our own Gramercy Theatre. 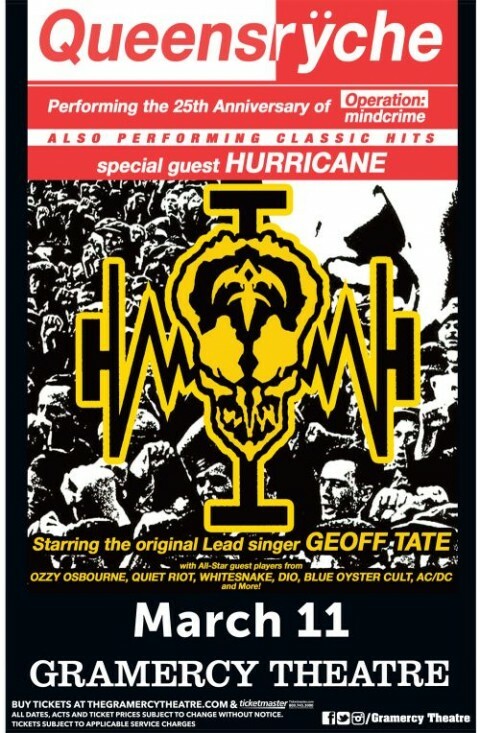 Queensryche will be joined by Hurricane on this tour and I enjoyed some of their output as well over the years. Geoff’s assembled a high energy lineup that features former members of Quiet Riot, Dio and more and will be celebrating the music of “Operation: Mindcrime”, an album that reached its 25th year in 2013 – it is one of my favorites and you probably agree . My charge of musical energy was increased when the fine folks at Livenation offered up a contest for the readers of the PiercingMetal site. Read on below to see participation rules. Cleopatra Records has been amazing in their issuing of the entire back catalog by the Helsinki Vampires, The 69 Eyes I’ve already reviewed a healthy chunk of them here on the website. Recently, the label announced an expanded edition of their greatest hits package “Framed In Blood: The Very Blessed Of The 69 Eyes” and that this version would have a now very hard to find DVD concert film included. Since I reviewed each of those already and there isn’t much else to say about them, I have decided to place both of those articles text here to speak about the new version. Take a look. 2006 CD Review: The 69 Eyes or the “Helsinki Vampires” as their fans know them best bring you a career spanning Greatest Hits with “Framed In Blood: The Very Blessed Of The 69 Eyes”. It is a nice collection of tracks from across their existence and offers a good look inside to the band for those that might be unaware or serve as a tasty sampler for those ardent fans. The Finnish group has a large following in Europe, but have only begun to make some ground in the US Market since 2005 and what this album does well is bring you back to the very early Glam-era stuff and leads you up until their harder edged Gothic sound that is the focus of the band today. The solid 18 track best-of has a number of great moments and you will find that singer Jyrki 69 definitely has a style that comes more rooted in older Rock and Roll than that of Metal (his vocals at times are very reminiscent of both Jim Morrison and Peter Steele). The deep, resonant tone shakes you up at times and yet is full of cryptic fire at others. Some stand out numbers are on this CD are “Brandon Lee”, “Gothic Girl” and “Wasting The Dawn” all of which are among my favorites from their catalog. New potential fans need only look into these tracks for it can easily make you a follower of their often hypnotic sound.